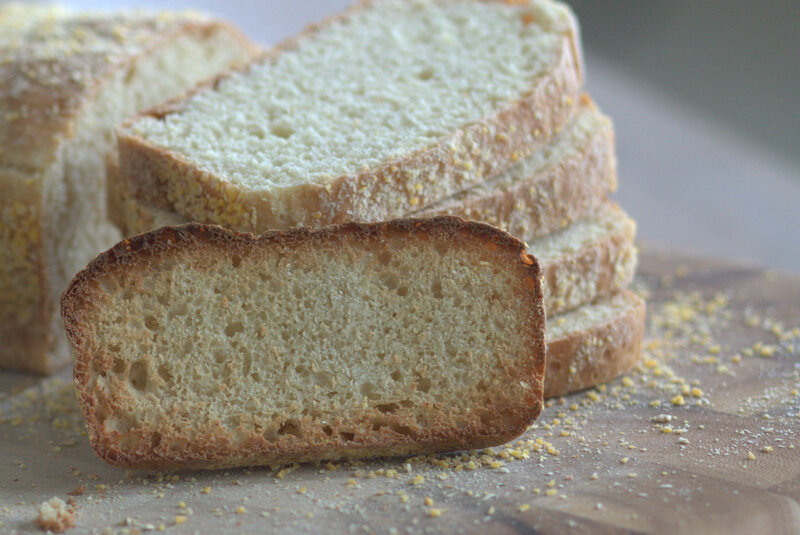 I was so excited to find a good recipe for English Muffin Bread because it will always remind me of having breakfast at my grandparents’ house after spending the night there. 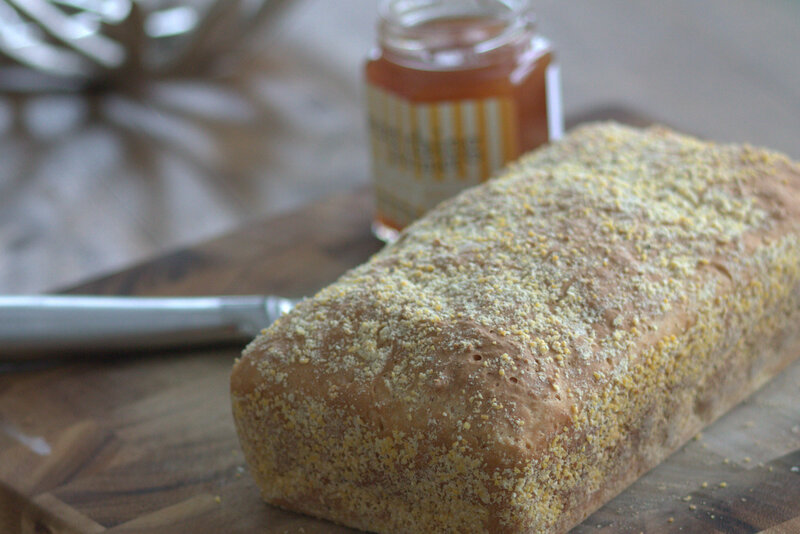 My grandma was a great cook (obviously – because she was a grandma, and that’s a requirement), but she didn’t make homemade English muffin bread. She bought it at the store. But as a little kid I had no idea why her toast was just better than ordinary toast. I’m proud to announce that I’m not quite as easily astounded by toast these days. However, I’d say that I still have a sincere appreciation for above average toast when I find it. (Which is also why I got so excited when I found a Toast Bar right in my neighborhood.) I am also excited when I can make something myself and know exactly what ingredients are in it instead of relying on a product with preservatives to give it that handy-dandy shelf life that’s so important. 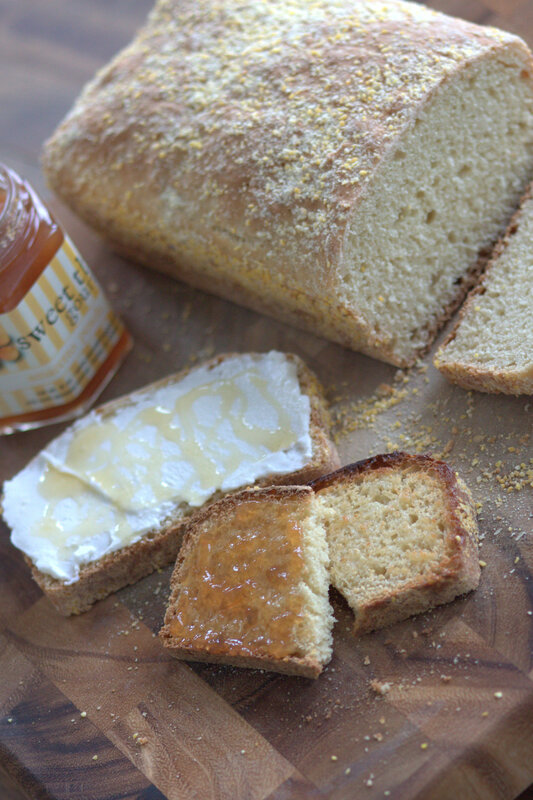 Aside from the fact that I’m always happy to have a loaf of fresh homemade bread in the house, I was also feeling inspired to make this because I thought it would be the perfect medium upon which to try my new amaretto peach jam – a Christmas gift from my husband! 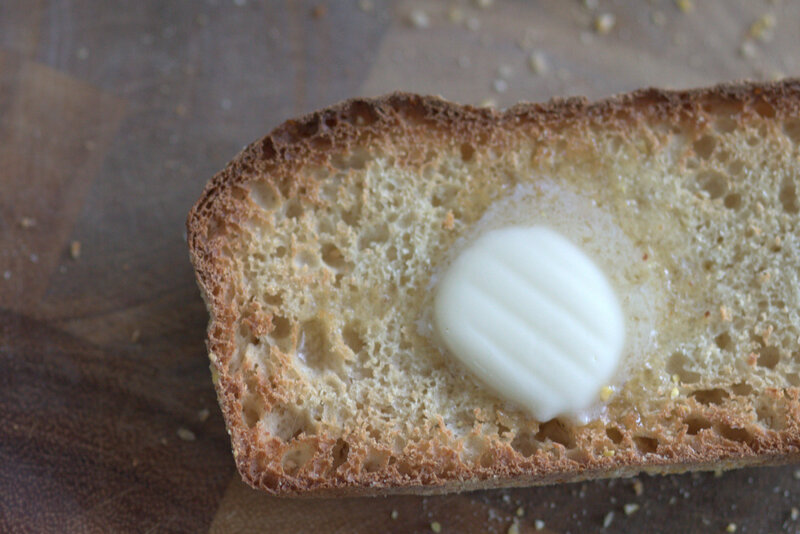 English Muffin Bread is a great delivery method for spreads or for a little pat of butter because it tastes super rich and dense and really holds up. This particular recipe has a cornmeal dusting on every surface which adds a super satisfying crunchy bite to the crust. Literally every single bite tastes perfect. The amaretto peach jam was exciting, not only because I love all things that remind me of almonds, and amaretto fits that requirement, but also because it was made by a local business operated from home. The product was sold in our local Whole Foods Market which intrigues me. (You mean, you can just make things? And sell them? To Whole Foods?!) The company is called Sweet Thing Gourmet. My husband was less interested in sampling the jam for himself, and he went the ricotta cheese and honey route (which I also tasted – to be thorough, you know? ), and I concluded that I approve of this topping choice as well. When it comes down to it though, very few things in this life beat a dollop of butter… am I right? This recipe was posted several years ago by a blogger who I loved and who has since stopped adding new posts (to my dismay). You can still visit her blog Eat, Live, Run, but sadly she is now depriving us of new recipes! Maybe some day she’ll pick it back up. However, this recipe was one that she posted as a guest on another blog, and it can be found here at Tasty Kitchen. English Muffin Bread? Yum!! Sounds perfect on a morning like today ~ snowy! Or any morning…in the Spring time while sitting outside with a morning cup of coffee and a slice or two of English Muffin Bread! So true!! 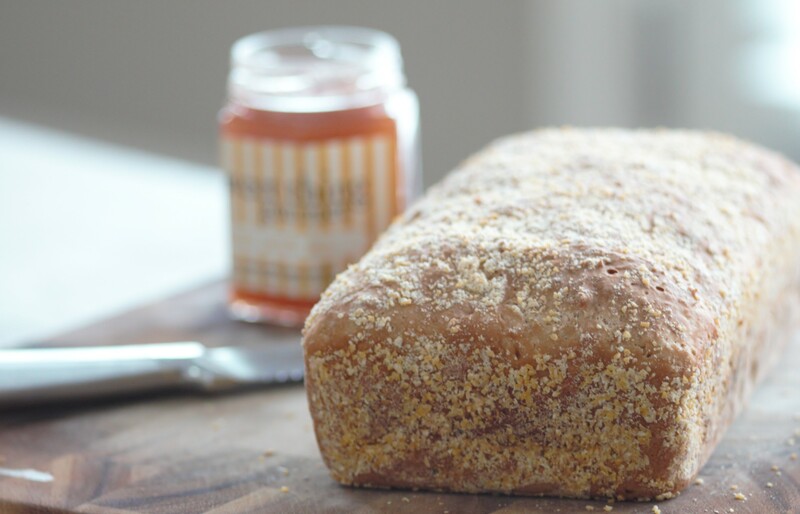 There’s never a wrong time for English Muffin Bread!! Thank you! Yeah, it’s one of those weird things that stuck with me – it’s hard to forget a really good toast!! I hope my wife’s cooking (which is already great) picks up even more if she becomes a grandma someday. Maybe she will make some English muffin bread. I will be glad to get her some amaretto peach jam to go with it. O yeah, I’m confident that no matter how good she already is, becoming a grandmother would be the detail that would really put her over the top.